This guide will detail the golden rules when it comes to buying Adidas Superstars on eBay. eBay is full of fake items, and it looks like this will continue to be the case for years to come. You cannot simply ask a seller "Is this item authentic?" - if they are dishonest enough to deal in fakes they will happily lie and say they are authentic. The only way to be sure is to know how to spot fakes yourself. 1. Feedback - always check through a sellers feedback. Any mention of fakes (however old) then leave them alone. 2. Photos - to be sure of what you are getting you'll need to see actual photos of the item. To be sure that these are the sellers photos they will need to include their eBay ID/tag within the photo itself. Many fake sellers use stock photos taken from PickYourShoes or similar websites, or simply steal other ebayers images. If the seller has nothing to hide then they should happily supply more (tagged) photos on request, if they dont then it's a risky purchase. 3. Common sense - if something looks too good to be true, it normally is. FACT - most of the 35th Anniversary Adidas Superstars on eBay are fake. Maybe a percentage of 90% fakes is not an exaggeration these days. It will continue this way if people continue to buy these shoddy replicas. Genuine 35th Anniversary shoes are highly sought after and worth a lot of money - eg Â£400-500 for the consortium series, if you see them for Â£40 buy-it-now then you would be mad to think they are genuine. I sell Adidas shoes professionally and can tell you that it is pretty much impossible to pick up a size run / batch of any 35th Anniversary Superstars now. So if you see people selling multiple pairs/sizes of Ian Browns, Lee Quinones, Disney etc Superstars then it would be highly unlikely that they are genuine. Common sense also applies to seller location / name - do not be surprised if you purchase a pair of shoes from an eBay seller based in China or someone with a name such as 'Discount Imports' and it turns out to be fake. Here's a couple of pointers to get you started or to compare your shoes to if you feel you may have purchased fakes. For releases from 2004-5 onwards (including 35th Anniversaries, Adicolors etc) genuine Adidas Superstars will not have 'Heel tags' (see images below). Obviously fake sellers can doctor the shoes to remove these or try to mislead you with alternative photos, but if your recent Superstars have these tags then unfortunately they are fake. 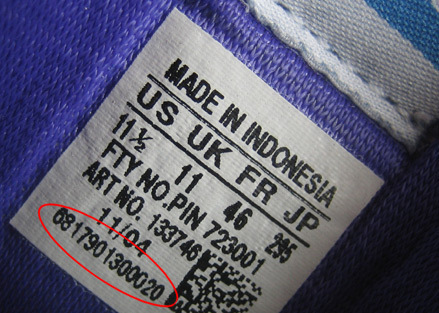 Adidas Superstars will have a different serial number on each shoe (found on the tongue label). If these numbers are identical then unfortunately the shoes are fake. If you wise up to these fake sellers and their dishonest ways there are still some amazing shoes to be found on eBay......it's just a case of trawling through the scum in order to find the gems. Hopefully this guide will help you do just that. Of course to be sure of buying genuine shoes you should check out my wares - mr-shoe-shotta - and superstardb.com is a great resource if you have any authenticity queries regarding Superstars on eBay.